AIS (Automatic Identification System) is a breakthrough product and, regardless of your opinion on its use, has changed its way mates handling heavy traffic situations via vessel tracking system service. Jotron, company makers of divers SOLAS compliant marine safety electronics, is looking to bring this revolution to Search And Rescue operations with the presentation of an Automatic Identification System (AIS) enabled Search And Rescue Transponder – SART for ship tracking. AIS SART device is going to work very similar to the traditional SARTs but, rather than show the location of a lifeboat on the 3cm radar, it is going to send the exact GPS coordinates to all AIS enabled devices with VHF range and help really much for vessel tracking. People are excited not only by the product itself - SART, but the advancement of included new ideas for sharing of information between the AIS network for ships position and ships tracking. Automatic Identification System - AIS is a great system but SART linear and data is stuck in predefined different categories of tracking vessels. Can a system be made that tides discussion and information sharing among vessel's captain, pilots and VTS? People would be really interested in a system that tides discussions and allows cooperation among all parties – it's a word not about AIS live ship tracking, it's about SART technology. Tere is an example of the failure of linear communication that could be the incident with Pasha Bulker. Unfortunately at 1st noticed of the weather system that last caused the ship to drag its anchor and ran aground, fifty-six vessels were anchored in Newcastle Harbor. Every ship received the same data through weather fax but forty-six vessels have decided to head for the safety of sea, and ten have stayed behind, three have dragged anchor and one has landed on the beach. Why had ten captains interpreted the weather information that differently from the other forty-six, no one knows? But one is sure – it would be much better if there was a good working implemented system for AIS SART faciliating the communication and a live vessel tracking system. AIS Search And Rescue Transponders - SART, devices which look very similar to EPIRBs that, when interrogated by X-band radar, produces a line of points on the radar screen pointing rescuers to sailors' location (fleet tracking of the ship position). 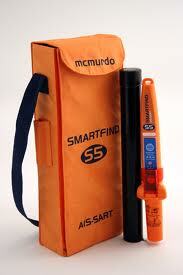 AIS SART fleet tracking devices are really good for scenarios with sailors overboard, simply throw them overboard and they drift in approximately the same way as the victim allowing you to home in on his location after completing a Williamson turn. If the vessel is sinking fast sailors will not bother with the GMDSS DSC autocall buttons (very useful system for fleet monitoring) as their undesignated distress alerts which are very often ignored. Sailors will also probably ignore the AIS SART beacon because it’s signal may only be seen some miles away, not like the live AIS fleet tracking systems which signal is broader in times or like the live satellite tracking system. At a close range, marine flares and a handheld VHF will likely be far more effective in fleet monitoring. Despite of whether a vessel is close by or beyond the horizon better choice for SOS calls to shore is an EPIRB used for vessel tracking. When an EPIRB is activated, the location of the ship position is submitted to the Coast Guard or local authorities that are going then relay the exact location to any nearby ships, by fleet monitoring systems. In addition to a global rescue signal the EPIRB also sends a homing signal on 121.5mhz, which giving rescue aircraft a relative bearing to search on vessels. At close range the EPIRB and AIS SART perform basically the same function by providing an electronic trail for the people - rescuers to follow to your vessel coordinates, however a ship would need a Radio Direction Finder (RDF) to track an EPIRB’s homing signal, whereas AIS SART may be tracked through radar commonly found on all vessels and some planes. There is no exact statistics how many ships these days carry RDFs, but it’s probably a low percentage which is very important for the safety and the fleet monitoring. Enter the AIS SART, a technology which was approved by the IMO (and even the FCC) to replace traditional AIS SARTS since 2007, but has only recently been fully adopted by manufacturers. While approximately new, that technology follows many of the same guidelines as traditional AIS SARTS for fleet monitoring systems.